The question to ask is what reform Juncker can deliver. Traditionally, Commission presidents haven’t been incredibly effective in pushing forward institutional change, and the last truly transformative Commission president was Jacques Delors, who led the Commission between 1985 and 1995 and pushed tremendously for economic and monetary union, culminating in the 1992 Maastricht treaty that bought the eurozone into existence. No one expects Juncker to effect the same kind of change as Delors did 20 years ago, and his task will be complicated by the fact that no one necessarily agrees what kind of ‘reform’ the European Union needs. Some people want Brussels to have wider controls over fiscal policy, some people want Brussels to take a more proactive role developing growth in countries like Greece and Spain, which are still suffering from depression-level unemployment. The scope and appetite for another round of treaty negotiations seems low, though German chancellor Angela Merkel has hinted that she might like to try. But Merkel and other national leaders, not Juncker, would have to be the catalyst for treaty-level change. The same goes for further banking union, the creation of any future ‘eurobond,’ or other major changes. Juncker would play a role in those efforts, certainly, but it’s not clear he’ll take the lead. Business leaders, in the meanwhile, expect the Juncker Commission to push forward a new data privacy directive and progress on the Transatlantic Trade and Investment Partnership, the free-trade agreement with the United States, both of which could transform the US-EU relationship. David Cameron backed himself into a tough position on Juncker. 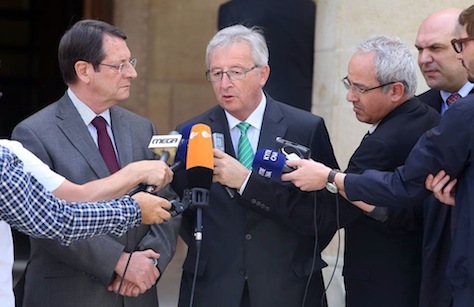 Even after the May 25 elections, no one was sure whether the 28 leaders that comprise the European Council would take the Spitzenkandidaten system seriously and propose Juncker as its candidate for the European Parliament. It initially seemed that Merkel, French president François Hollande, Italian prime minister Matteo Renzi and other top European leaders might try to find a compromise candidate, and in the early days after the May 25 vote, that actually seemed more likely than not to happen. But as parliamentary leaders hardened their stance regarding Juncker, making it clear the European parliament would reject any candidate other than Juncker, national leaders decided that it wasn’t worth forcing an institutional crisis throughout the summer over the Commission presidency. The Council, later this year, will choose the next Council president, succeeding Herman Van Rompuy, and a new high representative for foreign policy, succeeding Catherine Ashton. Under the Lisbon treaty, the lines of division between the Commission presidency and the Council presidency are incredibly unclear, so the next Council president may ultimately come to outshine Juncker as Commission president. Neither of those appointments need parliamentary approval, so that gives the Council free reign. So today’s decision is more of a strategic decision among Merkel, Hollande, Renzi and others not to force an institutional crisis. It’s nothing personal against Cameron, who will remain a key leader within the European Union, and who sees eye-to-eye with Merkel on many other substantive policy issues, including fiscal restraint and other matters. At home, Cameron has pledged to hold a referendum on British membership in the European Union in 2017 if his government is reelected next spring. Though the Conservatives are doing well in the polls now, there’s no assurance Cameron will win a second term in power, and if he does, the EU referendum will still be very difficult. UKIP’s victory in the May elections show just how hard it will be for even a united Tory/Labour/Liberal Democratic front to win that referendum. Before holding the vote, Cameron will try to renegotiate British EU membership on bespoke terms, though it’s not yet clear what concessions he’ll try to force — possibly in the areas of immigration or justice. To the extent Cameron was seen holding his ground today against Juncker, the epitome of the ‘Brussels man,’ a staunch European federalist, it will bolster his credentials among an electorate that’s become very disenchanted with European union generally. Previous PostHong Kong: One country, one-and-a-half systems?Next PostWill Prabowo Subianto become Indonesia’s next president?